The subject of continuity (a consistent setting and history over a series of works) always lingers around genre fiction like a bad smell. Regardless of the medium, works of sci-fi, fantasy and the like are often accused of having labyrinthine backstory. This, in turn, is then blamed for raising a barrier to entry so high that no one in their right mind will jump aboard. I’ve lost track of how many times I’ve heard this argument, either professionally, or stated in a press release for a series I love. Problem is, it’s nonsense. A rich continuity is not, in itself, a barrier to entry. The younger the reader/viewer/gamer, the truer this is. Kids and teenagers are information sponges – something society reinforces through phrases like: ‘You get as much out of something as you put in’. My (doubtlessly flawed) proof? The average child knows the names of more dinosaurs than his or her parents. Geekdom, in particular, is a knowledge-based hierarchy, where absorbing the minutiae of your chosen field of obsession is a goal in and of itself. Problem is, some people get less inclined to learn as they get older. Other pressures take over: jobs, family, mortgage etc. and they start absorbing entertainment in smaller and smaller chunks – ‘proper’ concentration is increasingly spent on ‘grown up’ things. There’s nothing intrinsically wrong with this, except for when these people start making publishing decisions (I’m looking at you, heads of Marvel and DC comics). As someone who’s self-aware enough to know that my tastes are never going to be fashionable, I find something uniquely terrifying about old men pretending that they know how those outside the process think. Why? Because old men invariably base their assumptions on what they want to read now, regardless of what their audience is looking for. The old man’s answer to badly-handled continuity is simple: Get rid of it. No one wants to read that stuff anyway. Ugh. Don’t get me wrong, I’m sure that bad, ugly, needlessly self-referential continuity does hurt sales, but it does so in exactly the same way that bad grammar, poor spelling and awful storytelling hurt sales. Being able to create and tell stories within a setting is a basic requirement of any writer. Presenting pertinent, pre-existing facts is no more optional than stringing words together into a sentence that doesn’t make your reader’s eyes bleed. It’s a shame, because there’s a secret to maintaining good continuity, and it’s not a particularly challenging one: only mention those things you need to reference, and do it either in a way that isn’t invasive, or in a way that enhances the story. It’s that easy, it really is. Problem is, too many inexperienced writers (or ones that should know better, at any rate) get caught up in making references to existing continuity at the expense of telling the story they’re supposed to be telling. The flawed result is then held up as a reason why continuity is bad, when the real lesson is that the writer needed a better editor, or simply wasn’t ready to attempt that story. Let’s be clear. Bad continuity can bring everything to a screaming halt – most commonly for assuming its reader has vital knowledge from three or four volumes (or years) ago. Comics are probably the most famous victim (or should that be culprit?) of this. Though the handy little editorial boxes that say things like Why is Spidey suddenly half-chicken? Check out Pointless Crossover #3, or As told in the now-classic Detective Comics #201, have pretty much vanished, there’s still plenty of tangled backstory out there, just waiting to be abused. Even worse is dumping missing info into the story in a single, eye-watering lump. No one needs to see this, and few people want to read it. Sadly, this is something that can probably be laid at Tolkien’s door. Most of the Lord of the Rings’ backstory is delivered, in monologue, through two chapters: Shadow of the Past, and The Council of Elrond. He could get away with it. The rest of us can’t. 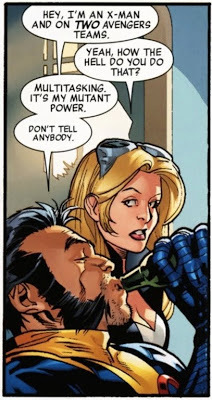 It’s also a bit strange when writers actively draw attention to the fact that their continuity can’t possibly work, as they’ve done a lot with Wolverine of late (he’s on every team apart from Power Pack, it seems). Asking us to suspend disbelief is one thing, drawing attention to the problem and then asking us to suspend disbelief is a bit weird. Maybe this’ll sort itself out once Wolvie shuffles through the revolving door that is death in the Marvel Universe, but I wouldn’t bet on it. Good continuity is a vital part of any setting. It’s one of the most basic tools of world-building. Why should anyone invest emotionally in characters and settings that don’t have a past? Mainstream (insofar as that word any longer has meaning) doesn’t have this problem. Why? Because the historical setting for mainsteam fiction is the history of the world we live in – it provides a shorthand that the writer doesn’t need to describe. Don’t believe me? Next time you read a book (of any kind, it doesn’t much matter), look out for words and phrases that only have meaning if applied to animals: sluggish, feline, bear hug, etc. These words only have meaning because of things that are physically present in our world and our history. They represent a continuity, of a sort one which many fantasy and sci-fi worlds can’t necessarily draw upon (can’t have a bear hug if there are no bears in your world). This is a really glib example, but it makes the point. Continuity is a bête noire, a whipping boy for poor sales and poor reception. However, to blame it for these things is to miss the point. But it’s a sign that collectively, the writer and his or her editors have not done their jobs properly. To blame the concept of continuity for a disjointed story is like blaming Samuel Johnson for a writer abusing the English language. Posted in Featured Blogs, Thoughts from the Tower and tagged Comics, Writing.